Massive KRALIK "Blue on Gold" Iridized Art Glass Vase c. Massive KRALIK "Blue on Gold" Iridized Art Glass Vase , circa 1910. FREE PICK-UP IN THE CHICAGOLAND AREA. Up for your consideration is a superb Kralik "blue on gold" iridized art glass vase, in a gorgeous Art Nouveau form, c. This is one of their most desired decors, and this is twice the largest example I have seen. 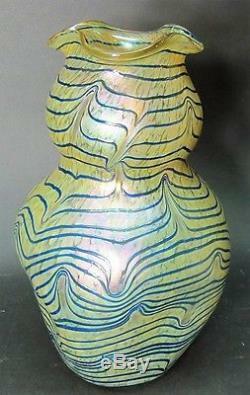 The vase measures 11.5" tall and 7.5" wide. It is well-iridized, and in flawless condition, free of chips, cracks, or damage. There is a polished pontil on the underside, and the piece is unsigned. The last photo shows the vase with a light bulb to show the size. This quote is for the Continental U. Only, and the item will be sent via UPS. International Buyers § Please Note. FREE scheduling, supersized images and templates. Get FREE counters from Vendio today! The item "Massive KRALIK Blue on Gold Iridized Art Glass Vase c. 1910 antique Bohemian" is in sale since Saturday, April 29, 2017. This item is in the category "Pottery & Glass\Glass\Art Glass\Bohemian/Czech\Kralik". The seller is "thesapphiregallery" and is located in Chicago, Illinois. This item can be shipped worldwide.